take these chances: i have a beach ball in my room. I cleaned out my room this weekend in preparation for the new school year. It was great. I donated a bunch of stuff to good will...gone with the old, on with the new. I love that Jesus always seems to give them to us. During my cleaning escapades, I found a sad, deflated, never-been-used beach ball. I had one of my friends blow it up just for fun - one of those whims that I get sometimes. I think I'm going to leave it inflated. It adds some color and life to my room, and reminds me of summer. It makes me smile and think about playing, and joy, and happiness. In a previous post I talked about shedding my "summer skin" and moving on - the old is gone, the new has come. But just because that summer skin is gone, and everything that was with it, doesn't mean that it was never there in the first place. Things don't disappear around here; God is not a magician. Things are renewed, restored, remade, redeemed....He is a Redeemer. 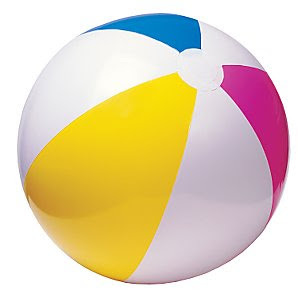 My beach ball reminds me of that - that my "summer" has been redeemed. It hasn't been erased, it hasn't been forgotten. It has been reborn...and the things that lacked joy, have it now in a new form. The things behind me are still there, but they have been redeemed and recreated into memorials, memories, and hopes. And now they make me smile. See what He has done for you. Go get yourself a beach ball :).